Will a Short Campaign Calendar Hurt Tina Smith’s Chances in 2018? 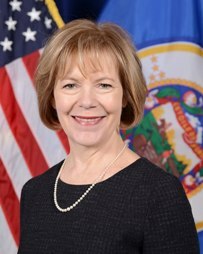 Minnesota’s unexpected election for its Class II U.S. Senate seat this November means appointee Tina Smith – seated on January 3rd – will have just 10 months to develop a record as an effective legislator for the state as well as fashion a winning general election campaign. Few Republicans believed they could pick off popular two-term senior Senator Amy Klobuchar whose seat is also on the ballot in 2018, but many see Senator Smith as a vulnerable incumbent with such little time to establish a positive record, raise money, and build name recognition. Smart Politics recently observed that Smith should be aided by Senator Klobuchar’s coattails in 2018 – voters have elected members from the same party 85 percent of the time when both senate seats were on the ballot in the same cycle (46 of 54 times since 1913). But will Smith’s compressed timeline aid or hurt her electoral chances? Smart Politics examined the 125 appointed U.S. Senators who ran to keep their seat since 1913 and found that 63 percent of those appointed to their seat less than one year before the election were victorious compared to just 43 percent of appointees who had more than a year. In the direct election era, nearly 200 men and women have been appointed to the U.S. Senate with 125 of these incumbents choosing to run for their seat the next time it appeared on the ballot. [Note: This data includes four appointed senators who did not run as candidates in the special election to fill the remainder of the term to which they were appointed, but instead to their state’s other seat for which an election was simultaneously held: Oregon Republican Charles McNary in 1918, New Mexico Republican Bronson Cutting in 1928, Minnesota Republican Joseph Ball in 1942, and Connecticut Republican William Purtell in 1952]. The election dates for 65 of these 125 seats, like that for Minnesota in 2018, was set less than one year from the date the appointed senator took office. Forty-one of these 65 senators secured a win at the ballot box, or 63.1 percent. Of the remaining 60 appointed senators who had more than a year to prepare for their election, only 26 were victorious, or just 43.3 percent. What could be the reason for this difference in reelection rates? Are more newly minted appointees still in the honeymoon period with their constituents? Do opposing parties need more time to build a case against an incumbent – and have greater difficulty doing so when incumbents have a thin record against which to launch attacks? Although these electoral stats are indeed curious, one should not jump to the conclusion that appointed senators have an inherent decided advantage the less time they have in office – particularly in the current political climate defined by big money. U.S. campaigns have become vastly more expensive to run in the last few decades, and a more recent review of the electoral fate of appointees suggests having more time to campaign, raise money, and build name recognition is advantageous. Over the last 25 years, appointed senators who served less than a year before their election have tallied only a .500 record – three wins and three losses. Democrat Bob Krueger of Texas (1993), Republican Sheila Frahm of Kansas (1996, lost nomination), and Republican Luther Strange of Alabama (2017, lost nomination) all were defeated at the ballot box since 1993, while Georgia Democrat Zell Miller (2000), New Jersey Democrat Bob Menendez (2006), and Mississippi Republican Roger Wicker (2008) were victorious. Meanwhile, appointed senators over the last quarter century who had more than a year to campaign have amassed an impressive 8-1 record. Winning their races were Rhode Island Republican Lincoln Chafee (2000), Alaska Republican Lisa Murkowski (2004), Wyoming Republican John Barrasso (2008), Colorado Democrat Michael Bennet (2010), New York Democrat Kirsten Gillibrand (2010), Nevada Republican Dean Heller (2012), Hawaii Democrat Brian Schatz (2014), and South Carolina Republican Tim Scott (2014). Only Missouri Democrat Jean Carnahan fell short – narrowly losing by 1.1 points in 2002 to former Congressman Jim Talent. Of course, if Senator Smith spends too much time campaigning and fundraising (and missing votes in the chamber), she will be criticized for not doing the job to which she was appointed. But if Smith is singularly focused on legislating and fails to build a sufficient campaign war chest, the prospects of coming up short in November alongside the popular Klobuchar on the ballot would be the kind of embarrassing electoral loss that would open her up to political critiques for years to come. Previous: How Do Failed Presidential Hopefuls Fare As US Senate Candidates? 4 Comments on "Will a Short Campaign Calendar Hurt Tina Smith’s Chances in 2018?" 1. Someday, Senator Scott may become a Democrat – but not in the near future, even after the infamous ‘s@%# hole’ remark directed towards 1/4 of the global population uttered by the leader of his party! 2. As for one of his colleagues from the Southland, Senator Wicker was appointed by Governor Barbour on 31 of 12 2007; he was sworn in by the Senate clerk moments prior to a year-end news conference announcing the selection (he initially intended to appoint him in early January or later, which would have permitted the by-election to be held sometime after the high-turnout presidential election – a historic one, as it turned out. To political insiders within the state political scene, Senator Smith is RELATIVELY unknown. To the bulk of the voters in the state, she is arguably TOTALLY unknown. Hence, unlike Attorney General Swanson or (senior) Senator Klobuchar, the electoral fate of Tina will likely be heavily dependent on the generic favourability of her party. Thus, it seems way more likely that her electoral fate is tied to the performance of the governor nominee at the top, rather than her in-state colleague’s. I agree she was basically an unknown to the electorate prior to her appointment. I think where i part is that I see her fate at the ballot box tied more to the senior senator’s performance than the DFL GOV nominee. The GOV race could be competitive, as it often is in MN, but if Klobuchar’s MoV gets to 20+ points (which is very plausible), it would take a poor campaign by Smith to inspire the kind of ticket-splitting for that office to lose. With Pawlenty taking himself out of the running, Smith seems more likely to hold on to her seat, regardless of the fates of her state legislative and gubernatorial ticketmates (and even though the state demographically resembles North Dakota, Hungary, and Slovenia more than North Carolina, Haiti, and Nigeria).